Toyota finally buried its Le Mans 24 Hours jinx and did so in style on a day that it allowed its two TS050 HYBRIDs to race - and race hard. 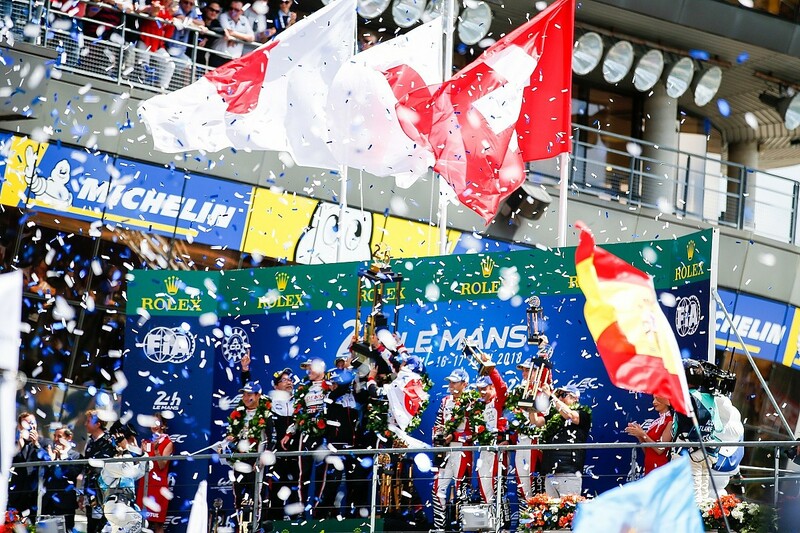 The Japanese manufacturer's cars put on a show last weekend as they ran without fault through the race and the easy conclusion to reach was that Fernando Alonso stole the show on the way to victory together with Sebastien Buemi and Kazuki Nakajima in the #8 machine. The two-time Formula 1 world champion hauled back the better part of a two-minute deficit to the leading #7 Toyota during a stirring quadruple stint in the small hours of Sunday morning. 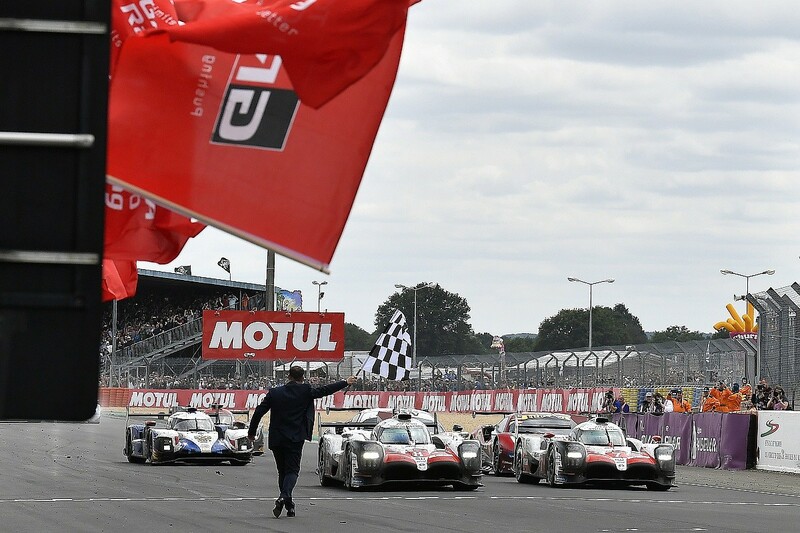 Yet it would be too simplistic to conclude the Le Mans rookie was the difference between the two crews in the second round of the 2018/19 World Endurance Championship superseason. Alonso climbed aboard the #8 for the second time in the race shortly before 1:30am on Sunday. Team-mate Mike Conway was more two minutes up the road in the #7, and Alonso quickly started to make up some of the lost ground. But by the time he climbed out after four stints, he was a shade under 40s behind Jose Maria Lopez. The Spaniard's stint of a few minutes more than two and a half hours in the darkness was a decisive period of the race, but it wasn't only the result of his phenomenal talents and a no-stone-unturned approach to his preparations for the French enduro and the unique challenge of the 8.47-mile Circuit de la Sarthe. The balance between the two Toyotas changed over the course of the race, and in the cool of the night Alonso's mount had a clear advantage over the #7 car in which Kamui Kobayashi joined Conway and Lopez. Alonso talked about how he "found a good rhythm" during his quadruple during the night, a stint he wanted to extend - even asking over the radio if he could stay in the car to turn it into quintuple! "There were some good stints there," he said afterwards. "The cold conditions seem to suit my style a little bit more and I took the maximum from the car." The reality was Alonso had a car in which it was easier to get to the maximum in those cooler conditions than it was in the sister Toyota. "When the temperatures dropped at night, we lacked a lot of front end with the car," explained Conway. "All through the night we dropped pace compared with the other car. That was the kind of turning point, even though the hotter conditions when the sun came up brought us back into the window." Conway, Kobayashi and Lopez struggled with set-up throughout race week and eventually decided to go down the same path as their opposite numbers in #8. But Lopez reckoned their team-mates still had the "better base" come race day. Nakajima and then Buemi also got more out of #8 than the drivers in #7 when they cycled through the car after Alonso. The Japanese driver continued to make inroads in the diminishing advantage held by Lopez and was within sight when he stopped for the first time during his own night-time quadruple. Kobayashi, now in and with the benefit of a fresh set of Michelins, was briefly able to stabilise the position of the #7 car at the head of the field after taking over from Lopez. But midway through hour 16, Nakajima eased past at Mulsanne Corner as his fellow countryman gave him plenty of room. Buemi continued to build the #8 car's lead early in his stint with some stunning laps - as well as a bit of luck with a slow zone - before the gap started to stabilise as the temperatures rose. The two Toyotas had been evenly matched for the opening hour and swapped positions multiple times in the early ebb and flow of the race. Then the #7 got its break at the end of the eighth hour and early in the ninth. This was when a slender advantage became a 40-second lead when Buemi lost time through the vagaries of the slow-zone system. It turned out to be a double whammy for the Swiss driver, who was then penalised with a one-minute stop-go for exceeding the 80km/h speed limit in the controlled area. The difference was the #8 car had the pace to gain back what had become the two-minute deficit during the night, but the #7 didn't really have anything for the leaders as the race drew to a close. The race already appeared to be over even before Lopez lost time with a quick spin in the 21st hour. Kobayashi revealed after the finish that he and his team-mates had given up the fight in the closing hours and were just concentrating on bringing their second position home. This explained, he said, a bizarre mistake with 90 or so minutes to go when he failed to come into the pits for a scheduled stop and had to complete much of the next lap using electrical power from the car's hybrid system. "We should have stopped after 11 laps, but I didn't box - I just forgot, that's it," he explained. "For us the race was gone, so we decided not to take risks, not to be aggressive. I slowed down and that is why I lost concentration." The #7 Toyota therefore received two penalties, both 10-second stop-goes, for that additional lap. One was for exceeding the maximum stint length of 11 laps under green flag conditions and the other for using more than the maximum amount of fuel over a stint. The time lost meant the gap between the two Toyotas went out to more than a lap for the first time of the race. The #7 actually ended up classified two laps down on the winning car because Kobayashi had to line up behind Nakajima for a formation finish ahead of the chequered flag. 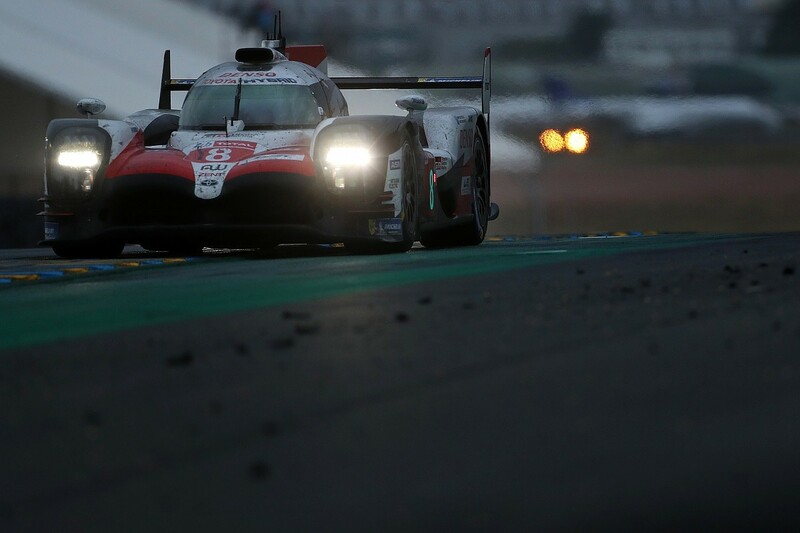 There was, predictably, no race between Toyota and the privateers at Le Mans, just as there hadn't been at the 2018/19 WEC season opener at Spa in May. The closest one of the non-hybrids came to the Toyotas was into the Dunlop Chicane on the opening lap when the nosecone of Andre Lotterer's Rebellion touched the rear end of the #8 car, though only because it was in the process of parting company with the rest of the car at the time. Just a lap into the 24 Hours, the leading Toyota was nearly three seconds up on the best of the Rebellion-Gibson R-13s. By the first round of pitstops, that margin was nigh on 20s. 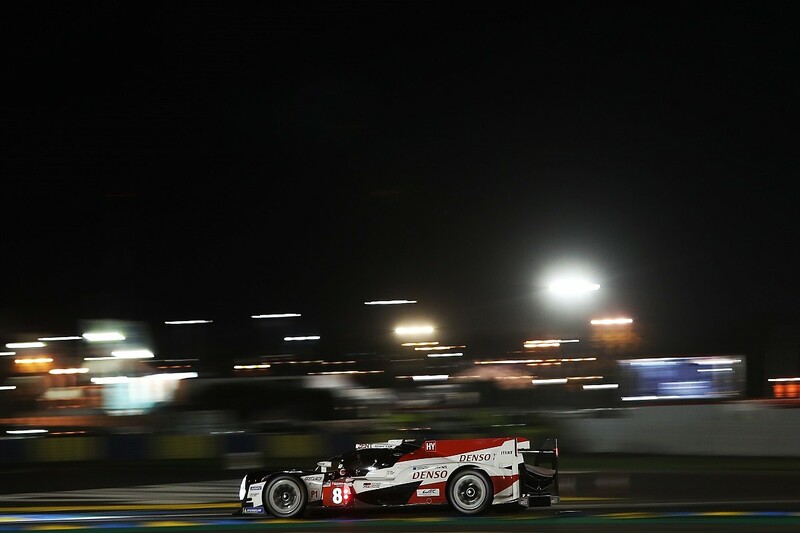 The TS050s held a one-lap advantage over the chasing pack as early as the third hour. However quick the best of the independents were over one clear racing lap - Neel Jani was under two and a half seconds slower than Buemi's fastest lap of the race - they couldn't lap as consistently quick as the Toyotas. The benefits of having a 400bhp kick on tap from their twin-hybrid systems resulted in a massive advantage in traffic for the leaders. "We're not too bad over one lap, but on a spread of times we are nowhere near the Toyotas," said Jani, who lined up in the #1 Rebellion with Lotterer and Bruno Senna. "We can lose 10 or 12s a lap if we are unlucky with traffic." The quickest of the privateers, the Rebellions and SMP Racing's BR Engineering BR1s powered by the AER V6 turbo engine, were never going to be in a position to benefit from any Toyota hiccups even if they hadn't run reliably. And they didn't. The Rebellions ran through to the finish to third and fourth, but they were a long way back after 24 hours of racing. The third-place R-13, shared by Thomas Laurent, Gustavo Menezes and Mathias Beche was 12 laps down at the chequered flag, with the #1 machine 13 adrift. Along the way, the R-13 - designed and built by ORECA - suffered a series of niggles that one might expect of a car that didn't run for the first time until the start of April. There were issues with the floor and the clutch on both cars, while the Lotterer/Jani/Senna Rebellion had a problem with one of its doors. It was this problem that decided the internal battle between the Swiss entrant's two cars in favour of Laurent, Menezes and Beche. And this explains why the team opted to leave Jani in the car for the final three hours. It didn't want to have to open the offending door again in case it couldn't be closed. Both BR1s run for SMP by the ART Grand Prix squad showed form. 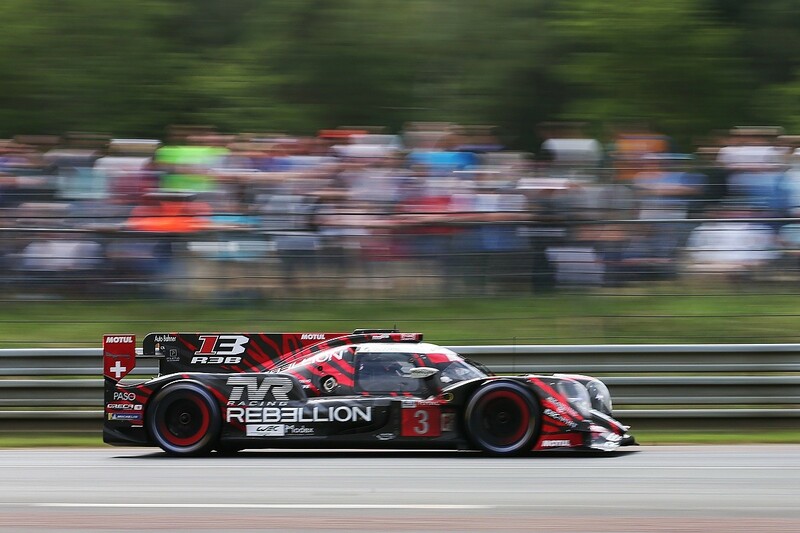 Stephane Sarrazin battled with Laurent in the opening stages and the car he shared with Matevos Isaakyan and Egor Orudzhev continued to fight it out with the #3 Rebellion for more than seven hours. But that car's race came to an end when Isaakyan spun in the second part of the double-left in the Porsche Curves, hit the barrier and was unable to get his damaged car going again. Or rather he did get going after considerable effort, only for the car to catch fire after limping along for a handful of metres. The sister car in which Jenson Button was making his Le Mans debut alongside Vitaly Petrov and Mikhail Aleshin stopped just before the end of the opening hour with an engine sensor issue and stayed there, apart from one slow lap, for three hours while the problem was located and resolved. The Dallara-developed car was as quick or if not quicker than the Rebellions when it finally got back on track, but also didn't see the finish like its sister car. An engine failure put the car out of the race early in the final hour. It was the privateers who hit problems, not Toyota for once. The Japanese manufacturer finally did what it failed to do so many times in the past, in 1998, '99, 2014, '16 and '17. It managed to beat Le Mans.